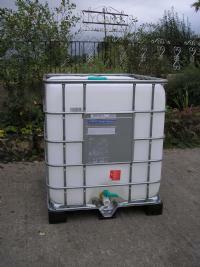 IBCs - Recycled Intermediate Bulk Container (IBC) previously used for mainly non-food use. Recycled Intermediate Bulk Container (IBC) previous uses include food products. 1000lt capacity. Please contact us for details on any 'specials' we may have in stock, these are as described but may have slight external damage. Appearance may vary from illustration, Quality will remain the same. Recycled Intermediate Bulk Container (IBC) previously used for food use.